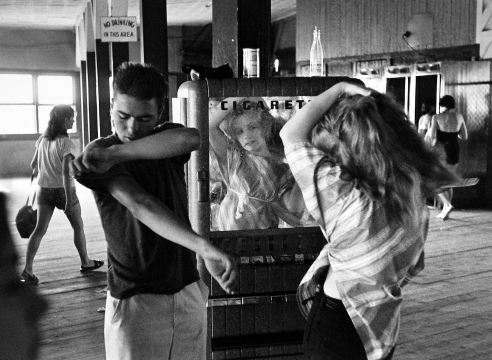 Photographs by Bruce Davidson and Miroslav Tichy´ are so different that they cast an eerie light on each other. Davidson has been a member of the elite photographers’ cooperative Magnum for nearly 60 years and has published numerous projects, including Brooklyn Gang (Twin Palms, 1998), East 100th Street (Harvard University Press, 1971), Central Park (Aperture Foundation, 1995), and Isaac Bashevis Singer And The Lower East Side (The University of Wisconsin Press, 2004). 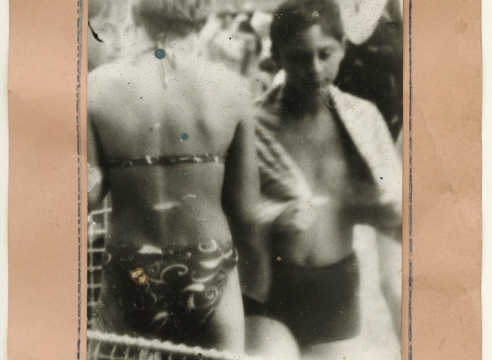 Tichy´, on the other hand, was an obscure artist working in his native Czechoslovakia during, primarily, the Soviet occupation. A promising young painter when the Soviets took over in 1948, in 1957 he had a breakdown that ended his painting career. Thereafter he became an eccentric, perhaps delusional character who walked the streets with a camera hand-crafted out of wood, paper-tubing and other odd parts that made most people think it didn’t even have film in it. But he did have film in it, and a selection of the prints he made is seen here. Whether his mental illness was real or just a charade meant to keep the Czech secret police at bay is an open question. The slovenly way in which the prints were made suggests that taking the pictures was more important to him than seeing the results. That said, the difference between his work and Davidson’s throws into relief the range of human needs that photography can satisfy. Davidson’s work is rigorously objective in its viewpoint. He’s documented the relationships of couples for the most part, including both women and the men they’re with. The result is a record of the relationship between the sexes of a certain class at a specific time in history. The photographs by Tichy´ are also of a specific historical moment, but are in every other way the dialectical opposite of Davidson’s. They are utterly subjective, indeed voyeuristic in character. They reflect the need, under a repressive regime, to live within your own head, to dummy up and maybe even dumb down your view of the world. Seen together, the two visions throw into relief the irreconcilable difference between the milieus in which these photographers have lived.